Will you be in Bend, Oregon Tuesday evening May 29th? If so, please join the Century of Action and its Oregon Suffrage Players, the Des Chutes Historical Museum, and the Oregon Encyclopedia, at McMenamins Old St. Francis School, for a packed, fun evening of sing-along education! 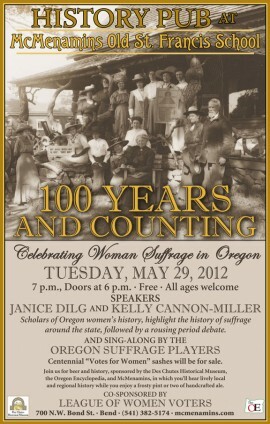 Begin the evening with illustrated presentations on Oregon woman suffrage history by Janice Dilg, and Bend 1912 suffrage campaign highlights by Kelly Cannon-Miller. After a beverage break the Oregon Suffrage Players will be joined by local Bend celebrities as they perform their crowd-pleasing “What’s Suffrage Got To Do With It?” town hall debate. Come show your support for the arguments made in 1912 about why women should, or should not, have the right to vote. Have you been wanting a commemorative centennial Votes for Women sash? Or a Long Live Oregon Men pin? You can purchase these items at the event, or online anytime.